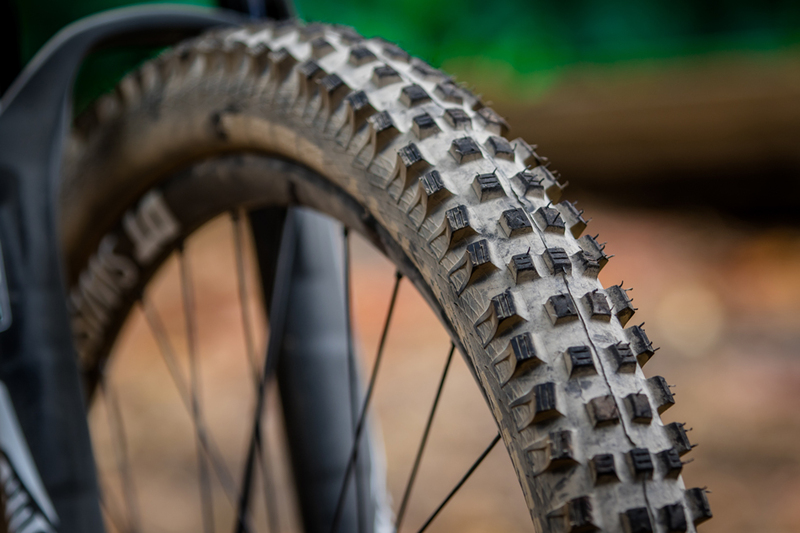 Schwalbe’s folding-bead SuperGravity casing blurs the line between all-mountain and downhill tire construction, utilizing four-ply sidewall construction and two-ply tubeless Snakeskin casing under the tread. This makes for a downhill tire that’s considerably lighter than its traditionally-built counterparts. 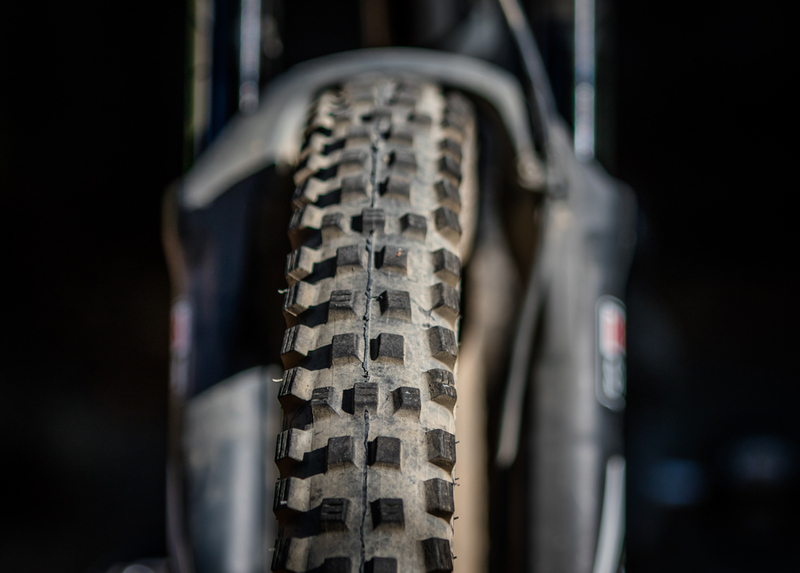 Both the Magic Mary and Hans Dampf SuperGravity tires are built on the Super Gravity casing, and each retails for $96. They’re designed to be run tubeless, and setting them up with a floor pump was a snap. 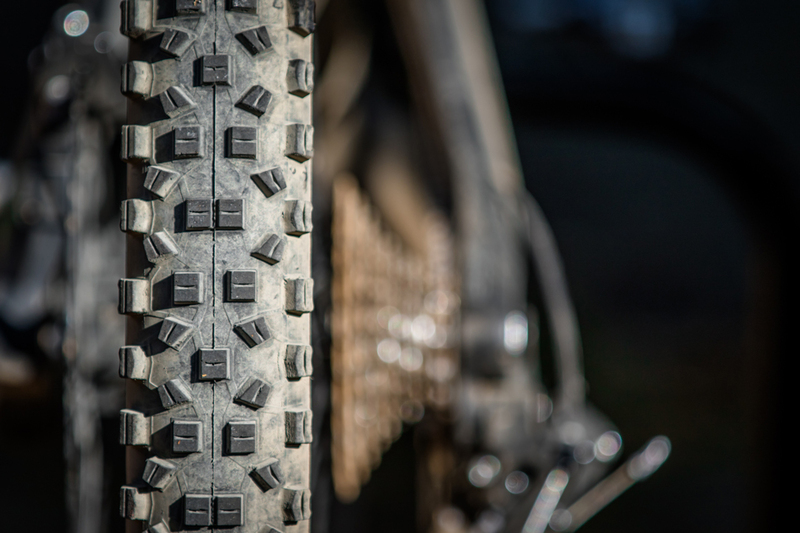 The Magic Mary resembles a cut mud spike, but upon closer inspection it's simply an aggressive, intermediate-height profile tire with widely spaced knobs that make it ideal for penetrating soft soil or finding traction on loose-over-hardpack trails. The 27.5, 2.35-inch-wide Magic Mary with SuperGravity casing and super-soft VertStar rubber compound weighed in at 1140 grams. That's 130 grams less than the 2.4-inch-wide Maxxis High Roller 2 downhill tire it replaced. The High Roller 2's large, relatively flat tread footprint performs well on hardpack and rocks, but on loose and unpredictable trails the Mary's pronounced tread is more effective at penetrating through the fluff to find traction and hold the intended line. For an aggressive tire with a block-style tread pattern, it rolls reasonably well on hard-packed berms and the knobs don't squirm when leaning heavily on the front end. The Hans Dampf has a rounded profile with subtle side knobs. Personally, I've never been comfortable using it as a front tire for aggressive riding. It performs well as a rear tire, though. The siped knobs conform very effectively to the ground’s topography, creating lots of traction. The Dampf's corner knobs felt a little washy, though, and I occasionally experienced a wandering rear wheel on high-speed berms. The 2.35 Hans Dampf (1040 grams) features the same SuperGravity casing as the Magic Mary, but is constructed with Schwalbe's longer-lasting and faster-rolling TrailStar compound. Neither tire felt undergunned on proper downhill terrain. Both delivered ample braking traction, and the comparatively lightweight and thin SuperGravity casing under the tread offers a noticeable level of suppleness on the trail. There were dozens of harsh impacts on jagged-edge rocks where I expected a puncture or compromised tire, but the casings shrugged off countless laps of bike park punishment. Riders who go through rubber quickly may be deterred by the price tags on these tires, which are about $15 higher than comparable offerings from Schwalbe’s competitors. Furthermore, these are downhill tires made from soft rubber compounds, so longevity comes second to traction. If you’re after something with a longer lifespan, both tires are available in longer-lasting, trail-oriented rubber compounds. What you won’t get with those compounds, at least in the case of the Magic Mary, is the same combination of traction and puncture resistance that makes it a winner when gravity takes hold.